Naughty Dog invited us to its Santa Monica studios on Monday for a look at Uncharted 2: Among Thieves, the PlayStation 3 exclusive that you should really be more excited for. How do we know? Seeing Uncharted 2's new "traversal gunplay" mechanics in real-time action, we couldn't help but become overly excited about the prospects of more treasure hunting, Nathan Drake-style. 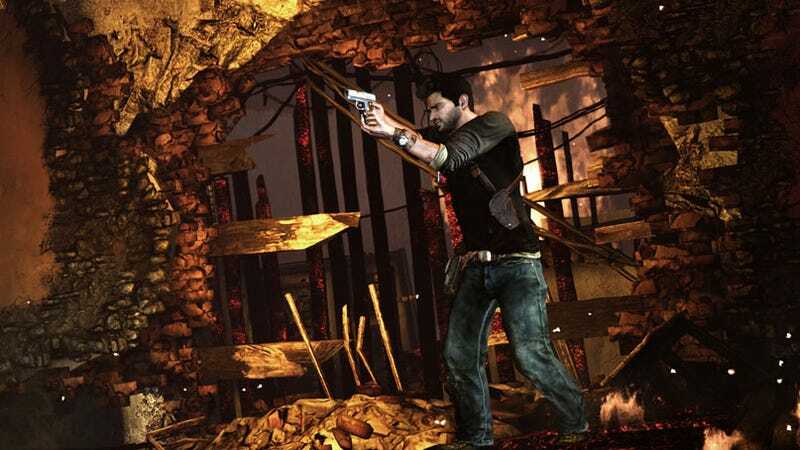 While the original Uncharted: Drake's Fortune was no slouch in the run, jump, climb and swing department, Drake's adventures in more urban environments look incredibly natural. Nathan Drake's motivation in Uncharted 2: Among Thieves is, well, greed to a certain degree. The lust for treasure and the answers to historical mysteries lures the perennially unkempt adventurer to a war-torn Nepalese city. And beyond, obviously. In search of the treasures of the court of Mongolian emperor Kublai Khan, reportedly lost with the disappearance of Marco Polo's fleet, Drake uncovers another mystery — the key to Shangri-La and the wish-fulfilling Cintamani Stone, said to be a giant sapphire that grants wishes and just happens to be worth billions. That's a lot of wish-fulfillment. Who wouldn't shoot the scores of gun-toting hirelings that are in between you and this stone? The sequel will also introduce another motivator, potential love interest and she-Drake, Chloe Frazier, pitched as his "equal in every way." The playable portions of Uncharted 2: Among Thieves that we saw, which also happened to introduce players to Drake's sidekick Chloe, were certainly impressive. Naughty Dog staffers cruised through the war-torn, military occupied (but unnamed) Nepalese city that Drake weasels his way past military checkpoints and into. This is where that much dreaded "stealth" portions of Uncharted 2 begin to present themselves. But here's the good news: This is no more a stealth game than the original Uncharted, based on what we saw. The PowerPoint slides boasted "Stealth or combat - your choice!" and, based on the run and gun action demonstrated, we'd agree with said slides that the choice is largely up to the player. The game looks to be heavily weighted to action and terrain "traversal," certainly more so than traditional stealth gameplay. We watched as Drake shot soldiers, slid behind rubble for cover, was knocked back by a fuel tank exploding, climbed up light poles, leaped from storefront signage to air conditioning units, crawled up fire escapes, scaled bookcases and jumped across an alley, pulling a military grunt from the ledge above. It was both action packed and smooth. We also witnessed some other neat tricks, including how Nathan Drake deals with riot shields. He, rather acrobatically, simply stomps on them, leaps over, then snatches them away from his enemy, using it for cover, adding more variety to the copious gunplay that we experienced in the original Uncharted. Naughty Dog teased some interesting gameplay concepts outside of what players might be expecting from the sequel. Some of those are a result of the environment, which will span snowy Himalayan mountains and lush jungle swamps. Others are products of the technology added to the Naughty Dog Engine 2.0, including the ability of large objects, like trains (see Spike VGA teaser trailer). More explicitly, its the ability to having "everything moving on moving objects." We're expecting to see Drake's train travels play an important part of Uncharted 2's level design, imagining that the interactive environment of a train moving up spiraling mountainside tracks will wreak havoc on a player's line of sight, not to mention the structurally unsound train itself. Naughty Dog also teased potential gameplay possibilities, such as Drake jumping from truck to truck in a convoy. These moments are likely what Naughty Dog's Amy Hennig was describing when she touted cinematic experiences with substance, not just spectacle. We certainly look forward to the substance of it all when Uncharted 2: Among Thieves is released later this year.